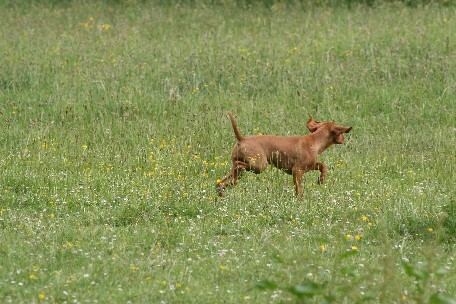 Mila - Addaci Mystic Ocean At Vizellven - was the highest scoring Vizsla on the day with 90 out of 100 points. She was just 10 months old. Harvey, Danllwyth Sundance, handled by Chilly wins 2nd place in Puppy. Hunting: 36/40 - Ground good, stubble field. Dog to hunt and quarter. Memory Retrieve: 16/20 - Go walked out 75 yards along the side of a wooded area to a stake in the ground. Sit the dog and chuck the dummy around the corner. Walk past the dog to the starting point. Recall the dog. Send the dog for the retrieve to be brought back to hand. Seen Retrieve: 19/20 - Dummy thown 50 yards away. Dog to mark the dummy and retrieve dummy to hand. 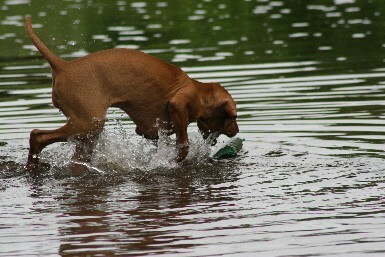 Water Retrieve: 17/20 - Dummy thrown across a stream almost to the bank. Dog sent for the retrieve in the water and is to retrieve to hand before shaking. 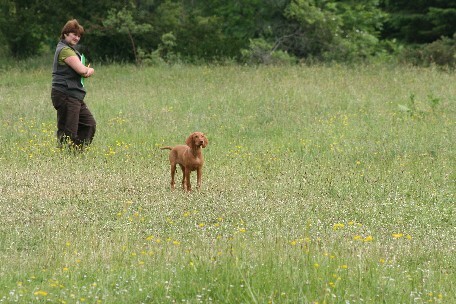 Harvey, Danllwyth Sundance, handled by Chilly placed 5th in Puppy. 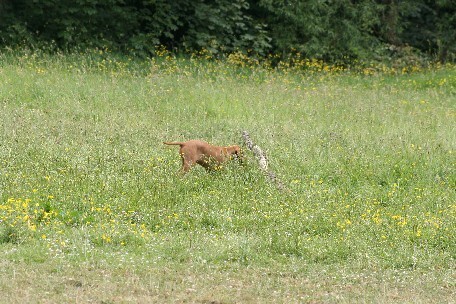 Hunting: 34/40 - Ground not great, just short cut grass! Dog to hunt and quarter. Memory Retrieve: 19/20 - Set out in an 'L' shape. Walk your dog to heel of the lead 50 yards to the first post. Sit the dog and walk across to the next post. Throw dummy. Walk back to the starting position. 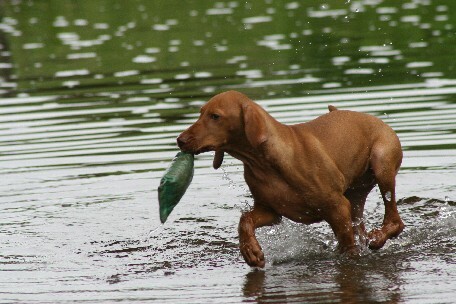 From the starting position, send your dog from where sat to retrieve the dummy to hand. Seen Retrieve: 20/20 - Dummy thrown 70 yards away. Dog to be sent and retrieve dummy to hand. Water Retrieve: 16/20 - Dummy thrown in water 20 yards out - Dog to be sent in the water and retrieve the dummy to hand before shaking. 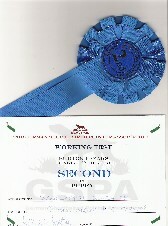 Harvey - Danllwyth Sundance placed 7th out of 20 in Puppy. A very good result with scores of 15/20 for Hunting, 17/20 for Seen Retrieve, 19/20 for Memory Retrieve & 16/20 for Waterwork. Introducing our little star - Ishca - Addaci Celtic Promise - handled by Co-owner Ellie Caughlin. Ishca at just 13 weeks of age passed with flying colours and was awarded the Certificate of NaturalAptitude. 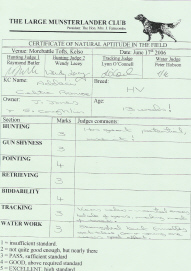 And finally she was awarded her Certificate Of Natural Aptitude In The Field. 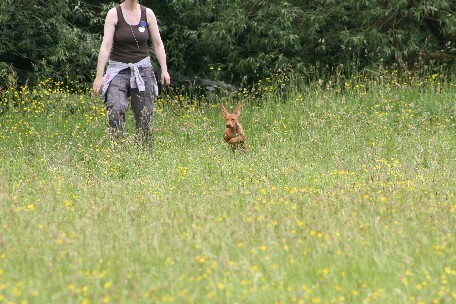 Not bad for a wee girlie of just 13 weeks of age. Ishca - Addaci Celtic Promise is living up to her name already and showing what great promise she has in store for us all.